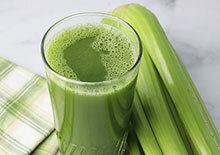 Why You Might Want to Consider It Celery juice is the liquid extracted from raw celery stalks and consuming a daily glass of this bright green drink has become a very popular worldwide trend, particularly starting in the latter half of 2018. The concept of juicing one particular vegetable variety at a time is occasionally referred to as "mono juicing." Instead of juicing several different types of fruits or vegetables together, like when making the typical green juice, mono juices specifically help to concentrate a fruit or vegetable’s health-enhancing constituents.